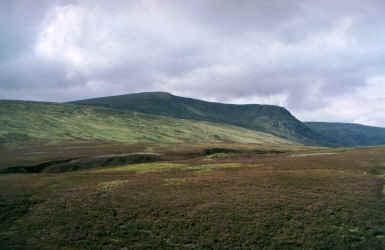 Sitting west of the Spey valley, the Monadhliath range of mountains is an empty landscape of rolling moorland, rising to a handful of Munro summits. There are four in total and this route takes in two of them. A'Chailleach is a well sculpted peak, a broad slope rising from the west to the top, before falling away dramatically into the glen occupied by the Allt a'Chaorainn. The name A'Chailleach translates from Gaelic as 'the old woman', which makes the proposition of 'mounting the top' an interesting thought. Her lumpy neighbour, Carn Sgulain (hill of the basket), lurks rather inconspicuously behind. There are various ways to tackle the pair, the most convenient starting point being the town of Newtonmore, originally built to accommodate people cleared from the land. It sits just a mile off the busy A9 and has a full range of shops and hotels, plus a small campsite. Set out from the Church of Scotland in the centre of town and head east along Church Terrace, the road immediately in front of the place of worship, passing between houses. Take a left up a track, which goes by a boarded up cottage, then narrows into a path, leading to a children's playpark above. As this is reached, bear right up a paved path, skirting the play area to reach Clune Terrace. Turn right and follow the street of white-washed local authority houses east to a BT phone box. Turn left here, following a single-track road up between open fields, crossing a cattlegrid. Stay with the road as it curves right, then left at a steading. Further on, the road swings right again, in front of a derelict cottage and continues to Strone, a pair of houses straddling the way. Continue to a rundown stone barn on the left. Leave the road here and turn left on to a track. This passes through a gate a few yards on and heads over open moorland, often used for sheep grazing. Ignore a waymarked path bisecting the track and continue north. Three quarters of a mile from the start of the track, it fords a stream (there are stepping-stones) and bears right. Continue on to reach a gate, shortly after two large stone cairns. From the gate, walk north to meet up with the Allt na Beinne. The route bears right here and follows the burn upstream, through a narrow glen carpeted in bracken and purple heather. The way starts to climb quite steeply, passing the site of a now demolished shelter known as the Green Bothy. It pulls out of the valley on to open hillside above and you should continue for a quarter of a mile to reach the Red Well, down to the left of the track. It sits just above the burn and is so called because the soil around it as been dyed a red-brown colour by the iron in the water. Stay with the track, heading north towards a craggy knoll, topped with an obvious cairn, on the west end of Am Bodach. The track ends at a grassy area where food is left for the local sheep population. Continue north from here, over open ground and skirt up into the col between Geal Charn and Am Bodach. 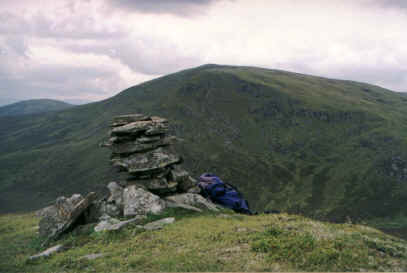 A short ascent over a grassy slope leads to the cairn, the one which has been in view for so long. Walk due north into the col on the north side of Am Bodach and pick up a fence of metal fence posts in the peaty dip. These rise up over the gentle east flank of Carn Sgulain. Underfoot, the way is a bit marshy in places, but it firms up as you approach the summit cairn (920m), perched atop a wide, stony plateau. From here, continue west into the next dip, staying with the fence, then leave it and skirt left over open moorland, down into the col at the top of the Allt Cuil na Caillich. From here, the ascent on to A'Chailleach is a short one and a pair of vehicle tracks can be seen on the slope above. The top of A'Chailleach (930m) is marked by a huge stone cairn. There are panoramic views from here, back to the top just conquered and, over to the west the steep, the craggy east face of Carn Dearg, another Munro. The descent is straightforward. An initially obvious path drops south from the summit, skirting across the hillside. 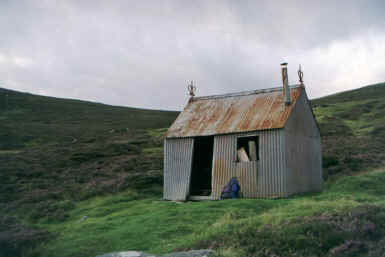 It is a little indistinct in places, but head for Red Bothy (marked on the map at grid ref 687023), a small tin hut once used by stalkers. The tiny corrugated iron building has unfortunately seen better days, but still provides some shelter in bad weather. A more obvious track, boggy in places, descends from here into the base of the glen, meeting up with a path on the opposite side of the Allt a'Chaorainn. This broads into a good track lower down which leads past a forestry plantation lower down to reach a small walkers' car park at the end of the public road out of Newtonmore. Follow the road for two miles back to the start. Map OS Landranger 1:50,000 sheet 35. Start/parking Free public car park in front of the Church of Scotland, signed from Newtonmore High Street. GR: 714993. Grading A long hike over open moorland for reasonably experienced hillwalkers. Route finding is straightforward with track and path in places and a line of fence posts to follow over Carn Sgulain. Stalking takes place here between September 20 and October 20. To assist the stalker, please phone for access permission during this time. The number is 01540 673 606.